A Serbian doctor will attend the autopsy of Slobodan Milosevic in the Netherlands on Sunday, as his family blames his death on The Hague tribunal. The former Yugoslav president, who was 64 and suffering from high blood pressure and heart problems, was found dead in his cell on Saturday. He died just months before the scheduled end of his trial for war crimes in the Balkans in the 1990s. 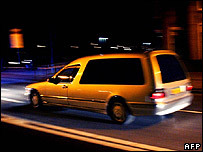 A funeral in Serbia could pose problems for his family. His widow Mirjana Markovic and son Marko are in Moscow and could be prosecuted in Serbia for alleged fraud. Mr Milosevic's body was transferred from his prison in Scheveningen, a suburb of The Hague, to the Netherlands Forensic Institute in the city, where it will be examined by Dutch doctors. A senior pathologist from Belgrade will observe the examination at the request of Serbia's National Council for Co-operation with The Hague, a tribunal spokeswoman said. The war crimes tribunal has requested a full autopsy and toxicological examination. Borislav Milosevic, the former leader's elder brother, accused The Hague of responsibility for his death by not allowing him to receive medical treatment in Russia during his trial. Mirjana Markovic, quoted by CNN, also said the tribunal had "killed" her husband. The tribunal has denied any blame, saying it took the utmost care of all detainees and of Mr Milosevic in particular. But correspondents say the tribunal is facing questions about its monitoring of inmates because Mr Milosevic's death came within a week of the suicide of the former Croatian Serb leader Milan Babic. Mr Milosevic had faced charges of war crimes and crimes against humanity in Bosnia, Croatia and Kosovo during the 1990s, and genocide in Bosnia. His body was discovered on Saturday morning by a guard at Scheveningen. The autopsy will determine both the time of death and the likely cause. A tribunal press office statement said there was no indication Milosevic had committed suicide. "The tribunal has nothing to be blamed for," tribunal spokesman Christian Chartier said. "[It] takes the utmost care of its indictees and of [Milosevic] in particular." Reaction to the death in Serbia has been mixed, ranging from fury and sympathy to some criticism of the former president, the BBC's Nick Thorpe reports from Belgrade. Candles burned late into the night outside the headquarters of his Socialist party, where bunches of flowers had been carefully placed in the doorway. Between the upstairs windows a portrait of Mr Milosevic looked down on passers-by as party members and sympathisers gathered inside to remember their former leader. But his enemies were bitter. "It is a pity that we will not see him facing justice, that we will not hear the verdict. 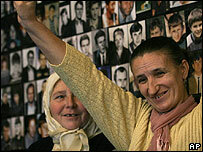 However, it seems that God punished him already," said Hajra Catic of the Association of Srebrenica Mothers. Another Bosnian Muslim, Husein Roncevic, told the BBC he feared that "by dying like this, he will become part of the Serb mythology". The authorities in Serbia have reacted cautiously, our correspondent says. Prime Minister Vojislav Kostunica offered his condolences to the Milosevic family and his party but said this was not the moment to say more. 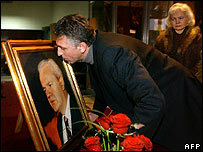 Serbia and Montenegro Foreign Minister Vuk Draskovic said it was a shame Milosevic had never faced justice in Serbia. However, an ex-US negotiator for the former Yugoslavia said the former ruler had faced justice "in a rough sort of way". "Here's a man who... got thrown out of power by a popular uprising in 2000, was packed off in a helicopter to The Hague in 2001 and spent the rest of his life in a padded cell in a jail," Richard Holbrooke said. "So, I'm not concerned about his fate, I consider the justice in this fate self-evident."